Tickets from Hawk’s Well Theatre. Tasmin Little was already being hailed as one of the finest violinists of her generation when in 2008 she turned the classical music industry on its head with her trail-blazing project, The Naked Violin, in which she offered free downloadable works for solo violin in a bid to encourage newcomers to classical music. Noted for her technical virtuosity, velvety tone and irresistible joie de vivre, Tasmin has played with many of the world’s greatest orchestras in a career that has taken her from Katowice to China. 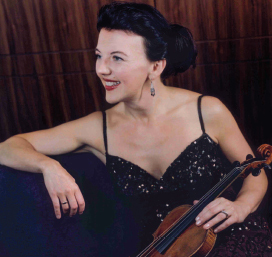 A champion of lesser-known works, in 2003 she wowed critics worldwide with her breathtaking performances of Ligeti’s challenging Violin Concerto while on tour with the Berlin Philharmonic and Sir Simon Rattle. In addition to her regular solo performances, she now play/directs orchestras such as Norwegian Chamber, London Mozart Players, Royal Philharmonic, European Union Chamber and Britten Sinfonia. Her twenty-three recordings range from Bruch and Brahms to Karlowicz and Arvo Pärt and in March this year she released her latest album, Partners in Time, to critical acclaim. Please note that The Naked Violin tour is interactive in nature and therefore there is a degree of flexibility within the programme. Tasmin plays a 1757 Guadagnini violin and has, on kind loan from the Royal Academy of Music, the ‘Regent’ Stradivarius of 1708.